Periscope is the newest social media platform – a live-streaming video app for mobile devices that lets you broadcast videos and interact with viewers in real-time. If you've not heard of it yet, you can get a better description here. The main reason it is loved? For the power of engaging your followers. Para leer esto en Espanol, ir aqui. Though it is quite new (spring 2015), brands and businesses are already evaluating Periscope's power to help them achieve their goals, and many are testing it out in hopes that it will be the next best marketing tool. What are they marketing? Information, products, services, all the same things as they used to market, but now on a new and exciting platform. 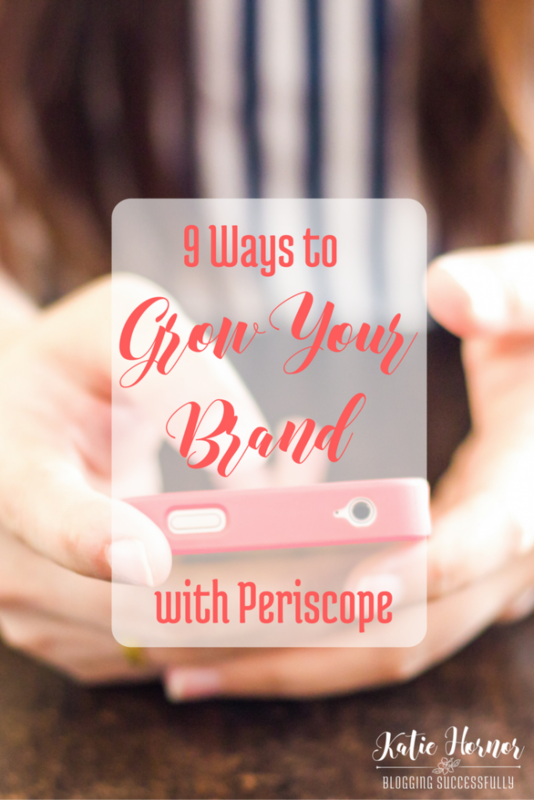 We discussed how to use Periscope professionally in the last post, and so today, I'd like to give you 9 practical ways you can use it to grow your brand and business, and examples of those who are doing just that. This site uses affiliate links. To read our full disclosure, click here. If Apple can do product launches on live-streaming tv, why can't you? Now with Periscope you can! Add scopes to your product launch strategy and it could increase your audience and exposure, and boost your sales. People love to be “the first” and part of the “breaking news” for a new product! Several leading blogging teachers, such as Darren Rowse @DarrenRouse and Leslie Samuel @LeslieSamuel have begun hosting live question and answer sessions whenever they have a few spare minutes. While it's not optimal for real coaching, if you are available to watch, it can be very helpful to get a pro's insights on your most burning question. The benefit of using Periscope for live demonstrations is the ability to see and answer questions immediately. With Google HOA's you have a chat box, but it's not as well designed as the instant comment view on Periscope. Pat Flynn @PatFlynn is one of the few who could build a following by sneezing! He exudes confidence and gratefulness and his rise to influence at a young age, and with a young family, tends to leave people star struck. He is having a positive impact on his business by using Periscope to take people behind the scenes and let them peak into his home life, and get to know him on a personal level. Kim Garst @KimGarst did this recently when she designed a flash sale for her Social Selling Inner Circle membership program, and then scoped to announce the sale and show others how to run one for their own products. Have a live event going on? Share live-streaming interviews or footage of the event. Jen Reyneri @JenReyneri just did this last week in Orlando with the International Christian Retail Show, (#icrshow) interviewing John Bevere @JohnBevere (author of “Good or God?”) and a few other popular authors and sharing a glimpse into their soon-to-be-released books. Lines busy? Long waiting times, hard to communicate via email? Offer customer service via Periscope. You can set the scope to be visible to only certain followers, making it better than skype, because the viewer can tap on their screen to send hearts in answer to questions or to show they understand as well as type chat-like comments. Just as you want to be where your target audience hangs out on other social media platforms, Periscope is also a great way to connect with them. Follow your clients, and customers, and follow those who are following you. Interact with their scopes, offer advice or information when appropriate. Periscope is being used by corporate businesses too! Mountain Dew @MountainDew recently scoped the new release of branded swag. They then chose a few of the viewers who commented and surprised them by sending them free gifts. How many want to go follow Mountain Dew on Periscope now? So, what do you think? Are you using Periscope for business? And if so, what other ideas do you have for using it to engage with and provide value to your target market?